This publishing strategy training classroom supported public access training programmes. These have now moved to in-company courses so if your team are interested then ask us about the details for you and your team. How can a Digital Training Academy boost your team's performance? Everyone has something to learn when it comes to digital channels, and we set up the Digital Training Academy to quickly boost the knowledge and skills of those working in digital marketing and media. This Academy is part of a wide portfolio that covers everything from the conversion course knowledge needed by newcomers, right up to advanced coaching for the heads of digital agencies. There are dozens of digital disciplines to choose from, so ask us about which mix best suits the needs of you and your team right now. We'll be keen to focus the Academy at exactly the right level, and whether you're in Europe, The Americas or Asia Pacific, we always customise the learning. As independent trainers, our work confidential and our only goal is to make you more successful. Thousands of firms across more than 20 countries have been helped by our tutors: how can we help you and your team achieve more? Click here for enquiries or to book courses. Start your day at Publishing Expo with a free clinic to tackle the issues that matter most to your business. Digital publishing pioneer Danny Meadows-Klue kicks off the day with a 45 minute workshop from the Digital Training Academy following an agenda that's entirely set by you. It could be about how to use Web 2.0, or the models for online advertising sales, how to write for the web or manage your content and data - the topics are up to you. As always, Danny will be giving frank advice and unmasking some of the principles that will help you get the most from your online publications. Places are limited and the special session is guaranteed to fill fast, with priority given to participants who send questions in to Digital's team in advance. As part of the clinic there's a live online classroom and all questions will be written up for participants to learn from. In 1995 Danny became the first product manager of an online media business in the UK, helping run the Daily Telegraph's pioneering websites. Later he helped create and then ran the UK and European Internet Advertising Bureau organisations. In his 13 years of online publishing experience, he's run online magazines, shops, search engines, email publications and through his training session helped thousands of online publishers in more than 20 countries. Hundreds of the world’s leading newspapers, magazines and portals have benefited from the Digital Media Sales Academy, and this is a rare chance for any publisher to access key insights at no cost from one of the world’s online publishing pioneers. Media teams have real challenges crossing over from print and broadcast to sell online successfully and in this Executive level Digital Training Academy we share key perspectives about how this can be accelerated. With advertisers leaping into Google, building brand sites, and extending their email marketing it's key that media brands get the sales proposition right. What are the 10 things you need to know before you start selling online? What does the future holds for online advertising vs. print? How can sales be integrated between both channels? Attendees will have access to online tuition support after the event. Online advertising is growing up. The advertising models for delivering revenue growth have come a long way since 2000, and at INMA's first Internet Advertising Summit, digital publishing pioneer Danny Meadows-Klue gives forecasts for the key changes and trends in the online advertising market in Europe in 2008-9. What is happening to advertising effectiveness? How will advertising revenue growth continue? What will happen with video formats? How will demands for targeting change? Based on two years of research by Digital Strategy Consulting and the experiences from Digital Training Academy's work to coach media planners and clients across Europe, Danny looks at the reasons behind changes in yield, advertising models and the overall growth of revenues. Questions submitted online in the main Digital Publishing Strategy Classroom. With rapid development continuing to be the norm, publishers need to be able to read the landscape and work as a team to set the right direction. Familiarity with the key principles behind different generations of websites is the starting point in that navigation. This reveals implications for the site’s business models and explains why some add little value and represent false paths, while others lead through the easy ground towards strong commercial growth. Digital’s Publishing Strategy Academy is the guaranteed way to boost your leadership team’s insights into digital publishing. At a time when the media landscape is undergoing such rapid and profound change, firms are suddenly faced with huge strategic decisions about their brands, technologies and business futures. Designed by some of the world’s pioneers in online publishing, it covers the latest trends and includes an online learning programme to get participants practicing their blogging, communities, social media and Web 2.0 content. We’ve been coaching online publishers since 2000 to help them and their teams achieve more. To support this Digital Training Academy there is a Digital Classroom with articles, links, a video lecture and some discussion materials. You can enter the classroom, and once inside remember to bookmark it so you can get back to class easily. If you have any problems accessing the classroom then visit our help centre. In times of huge economic and technical change, knowledge becomes a critical success factor. Alongside the training and development services available in the Digital Training Academy, we created a series papers you can download and share with your team. What is your online advertising market really worth? Where should your sales teams focus their effort? Planning your online sales means knowing how to read the advertising industry data about online adspend, web advertising, and where the growth in internet marketing spend is coming from. Increasing internet advertising revenues demands a good understanding of where the market is, and with the research data weak in many countries, many formats, or for many sectors, commercial directors can easily misread the landscape. Get it right and revenues accelerate; get it wrong and the whole sales engine is running to stand still. This digital management strategy coaching exercise will have you question what your data is telling you. 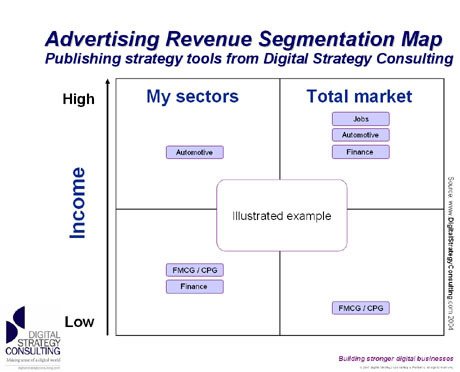 Your team can then apply Digital’s Advertising Revenue Segmentation Map for publishers to run a gap analysis on where your ad sales efforts should concentrate. In-company deployments of this programme are customized to the specific sector and revenue strategy challenges you face. Digital’s consultants can transfer the ideas from our workshops into sales planning tools for internet publishers. Our digital management strategy coaching can help you see your markets and products differently, boosting your revenues and unlocking new strategies for growth. It helps you provide stronger leadership and has been proven to transform the revenues of media groups. Work with independent experts whose only interest is in increasing your internet advertising sales revenues and raising the traffic to online magazine, newspaper, portal, community and ASP services.